Have you ever stood around, nervously checking your wristwatch as a friend or significant other cycled through their entire wardrobe trying to find the perfect outfit? If your experience were anything like ours, they probably started with a perfectly acceptable look and finished with an ensemble almost exactly the same as the first one, albeit painstakingly composed of entirely different pieces of clothing. Most people would never notice the difference without the subtle changes being pointed out to them. 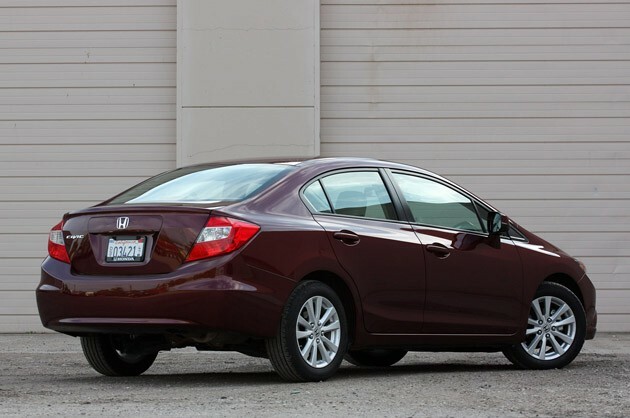 The 2012 Honda Civic sedan's new duds are kind of like that. Honda stylists have taken great pains to tug and pull at virtually every bit of clothing their new Civic is wearing. In spite of this, the car looks largely the same as its eighth-generation predecessor, a model that first bowed in 2005. This, despite the fact that the wheelbase has been cropped from 106.3 inches to 105.1 (you'd be hard-pressed to notice unless you had a tape measure handy), a change that helps make it the shortest car in its class. This all-new-yet-same-as-it-ever-was judgment isn't really the slight it might seem – the 2006 Civic was a groundbreaking design, and its slippery form and delicate features have worn well over the years. At the very least, this new model is still unlikely to be confused for anything else on the road. Honda has determinedly avoided the trend toward oversized headlamps and gaping air intakes, and has similarly shied away from the big-pillar look in favor of improved visibility and cockpit airiness. Even still, we can't help but feel this new Civic has gone a bit conservative – particularly in the rear, where distinctive eagle's head taillamps have given way to more traditional fixtures. Much the same can be said for the interior, which is actually all-new but looks largely the same as the 2011 model. That means drivers are greeted by an evolution of the Civic's love/hate two-tier dashboard that puts the front-and-center digital speedometer on a different plane than the analog rev counter and secondary gauges. It's still a configuration that takes a few moments to get used to, but all gauges are easy to read, even in bright sunlight. The digital speedo is flanked on the right by a crisp new five-inch Multi-Information Display (i-MID) that displays everything from stereo information to Bluetooth status and trip computer functions with pleasingly high-resolution graphics. You can even set your own wallpaper background. (Side note: Although our EX test subject didn't arrive with GPS, we've driven other models so equipped and the new i-MID's resolution makes the aging main navigation screen look decidedly yestertech). 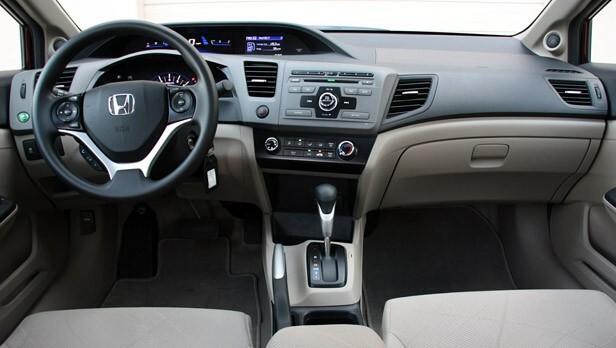 The Civic's center stack is canted dramatically toward the driver and dominated by the audio controls with an easy layout and Playskool-sized buttons. The head-unit is a bit odd in that it doesn't have its own display – you have to look up and over at i-Mid for information. We got used to this after memorizing the button configuration on the stereo, but would still prefer a station/track readout on the unit itself. All other controls, including those for climate and such are a model of simplicity. Despite having a shorter wheelbase (all other major exterior measurements are identical to last year's model), the Civic still feels quite roomy on the inside. In fact, Honda says that interior space is up by 3.7 cubic feet, primarily in the form of added shoulder room up front along with increased hip room front and rear. Seating position is typically Honda, which is to say sportier than the norm, low to the floor and legs out. Outward visibility is peerless thanks to the expansive, minivan-like windshield and new, slimmer A-pillars. Hard plastics abound and feel somewhat cheaper than the departing model, but at least they are well textured, with many pieces covered in an interesting mulberry-paper-like surfacing. The new steering wheel is also a winner, with a pleasing size and feel-good new multi-function buttons. Despite the cropped wheelbase, rear legroom is still up there with the very best in its class, although hip- and headroom are somewhat less generous. Cargo space is up, too, to a still-modest 12.5 cubic-feet (up .5 cubes), though we were dismayed to find no external release on the trunk (necessitating the use of the floor-mounted driver's opener or the key fob), along with no liner or interior grab handle – you'll have to grab sharp metal if you want to avoid getting your hand dirty on the decklid. Interestingly, Honda has chosen to eschew the latest round of multispeed gearboxes and engine tricks like direct-injection or forced induction in favor of preserving the Civic's lighter-than-average weight and less-costly measures like aero refinements (smooth underbelly, aero fences ahead of the wheels, low drag mirrors, etc.) to deliver class-competitive performance numbers. 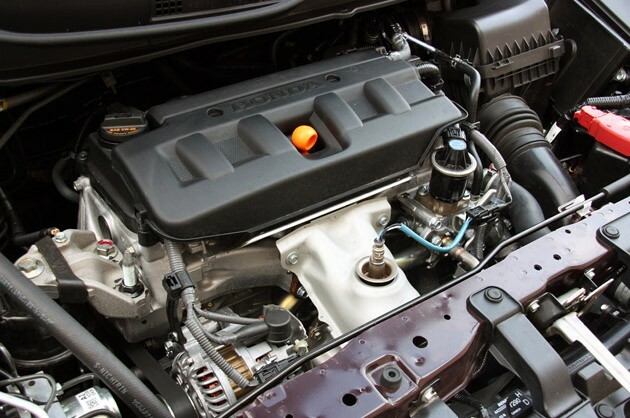 In our EX model, that means the 1.8-liter SOHC four-cylinder returns with few modifications, producing 140 horsepower at 6,300 rpm and 128 pound-feet of torque at 4,300 rpm routed through a conventional five-speed automatic. As hinted at with those power figures, the 1.8 is still a free-revving piece whose wheelhouse is still located largely in its upper registers. Our internal accelerometer suggests a 0-60 time in the low nine-second range, which is right in the heart of the class. Use of high-strength steel in the ninth-generation Civic's chassis has increased to 55 percent (up five percent). That change at once once improves rigidity by 10 percent and lowers body weight by seven percent (EX models like ours check in at 2,765 pounds). Thanks in part to the Civic's light weight, EPA fuel economy estimates check in at 28 miles per gallon in the city, 39 on the highway. In predominantly highway driving, our still-green EX (just over 2,700 clicks on the odometer) returned a respectable 32.9 mpg. Prices for the 2012 Civic start at $16,575 for a basic, row-your-own DX ($15,805 plus $770 delivery), putting it shoulder-to-shoulder with sedans like the Mazda3 and Ford Focus. Opt for the $21,275 (including destination charges) automatic-only EX like our tester and you'll be treated to a power moonroof, hands-free calling, alloy wheels, and a six-speaker audio system with Bluetooth audio among other features. If you're wondering why we've left discussion of the Civic's driving dynamics until the very end, it's because it's an unremarkable steer, veering more toward a 'set it and forget it' commuter mindset than something that's likely to be of interest to auto aficionados (who would be better off pursuing the sporty Si model anyhow). It's certainly a refined drive, but one would think that a shorter wheelbase and modestly lower weight (between 20 and 58 pounds lighter depending on model) would lead to a friskier-handling car – indeed, Honda claims it to be so – but we found this 2012 Civic to be a humdrum performer that neither encourages or rewards enthusiastic driving. Chief among the culprits for the white-goods driving experience is the new electronic power steering unit, which includes a slower ratio for less energetic turn-in, along with a more compliant suspension that delivers improved ride quality at the expense of informing the driver. The brakes (upgraded to rear discs on our EX) are unerringly quiet, but we noticed some fade when driving only modestly hard on what few twisty roads Southeastern Michigan has to offer. To be fair, we suspect that the 2012 Civic's absolute limits meet or exceed those of its predecessor in most areas, but it simply doesn't feel as engaging as the outgoing car, let alone competitors like the Mazda or Ford. In a remarkable-for-us move, we turned on – and left on – the Civic's green Econ button after messing about with it off for a bit, as we decided we'd rather benefit from the improved fuel economy offered by the miser mode's more deliberate throttle tuning, remapped shift schedule and parsimonious climate control operation. It simply wasn't worth trying to eke out the sliver of additional driving satisfaction promised by the normal mode. Let's be clear: We're not here to suggest that Honda's careful maturation of the Civic is a mistake – we think the majority of small car buyers will appreciate its improved composure and refinement, and we applaud Honda's engineers for not packing on the pounds. But you're reading this review on Autoblog, and this suggests that you're probably more interested in driving dynamics than the average bear. On this front, the Civic's newfound maturity has come at the expense of liveliness found in both its previous iterations and some of its competitors. Unfortunately, nothing about this new Civic, from its design to its interior appointments to its fuel economy and pricing, has stepped up in exchange to help it stand out from the competition.